The government will make a statement in the Lok Sabha tomorrow on the treatment meted out by Pakistan to the family members of Kulbhushan Jadhav. NEW DELHI: The government will make a statement in the Lok Sabha tomorrow on the treatment meted out by Pakistan to the family members of Kulbhushan Jadhav, External Affairs Minister Sushma Swaraj today said. During the Zero Hour, members of various political parties, including the Congress, Shiv Sena, Trinamool Congress and AIADMK, strongly protested the way Jadhav's family members were treated by Pakistan authorities when they had gone there to meet Jadhav, who is languishing in a Pakistani prison. Swaraj, who was present in the House, said a statement on the issue would be made tomorrow. While strongly criticising the happenings, Congress leader in the Lok Sabha Mallikarjun Kharge demanded that Jadhav should be brought back. Shiv Sena's Arvind Sawant also raised the issue and said India should not keep silent in the matter. Describing Pakistan as "hypocritical", Trinamool Congress leader Saugata Roy said the incident should be criticised and demanded that Swaraj should speak on the issue. Condemning the incident, AIADMK M Thambidurai said asking a woman to remove her 'mangal sutra' is an insult to the country. 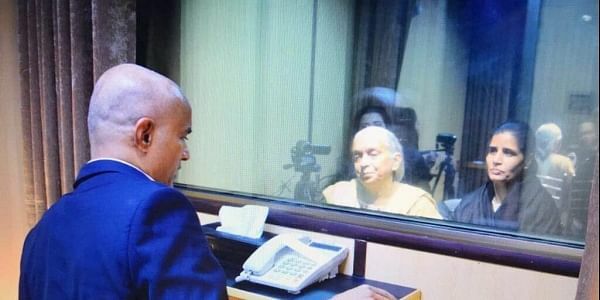 The meeting between Jadhav and his mother and wife took place on December 25 at the Pakistani foreign affairs ministry in Islamabad after repeated requests by India for family access. Jadhav, who was arrested in March, was sentenced to death by a Pakistani military court for alleged spying, an accusation that India has dismissed as concocted. On Tuesday, India accused Pakistan of violating mutual understanding on Jadhav's meeting with his family, and said the Indian national appeared coerced and under considerable stress during the tightly-controlled interaction. Pakistan went so far as to have the mangal sutra, bangles and bindi of his mother and wife removed before they could meet him, the external affairs ministry had said on Tuesday.